Have you ever gotten on a plane only to find the door won’t latch? Not the bathroom door. The door that keeps you sealed safely in the plane. It happened to us early one morning and I can tell you it bugged me. Arriving back at the airport the day after a canceled flight the evening before, the attendant upgraded our tickets to first class, "Considering your inconvenience," he said. No argument from us. We took our seats, front row, all roomy and soft, and turned into the pleasant, smiling people most flights make it impossible to be. “Care for coffee or tea? A sweet roll?” the attendant asked. Who would resist, especially since we were new to flying first class and the refreshments were brought to us on a platter, the cups fine china? All was good, until the cabin crew couldn’t arm the door. They tried. As we sat there nibbling our rolls and sipping our tea and coffee, we were certain we’d be leaving any minute. Time passed and the door still wasn’t armed. We squirmed in our seats a little, the air-conditioning not up to speed. The attendant offered us cool, refreshing drinks, as though trying to pacify unruly children. 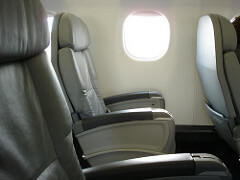 We glanced over our shoulders at the poor passengers in back, squeezed into tiny seats, who had to fend for themselves. Soon maintenance men arrived carrying a tool box. Oh no, I thought, this must be serious. I sat back, closed my eyes and let my imagination run wild. High above the ground, mid flight to Nashville the door pops open. The slide inflates just in time as we're sucked out of the plane. Can I catch it and hold on? Uh, the plane’s going six-hundred miles an hour. I doubt you’re going to get a good grasp before you plunge straight to your death, I tell myself. Who will come to my funeral? I wonder. How hard will the mourners cry? James and I looked at each other. Had we come this close to flying first class only to get pushed back to our usual crowded seats? But alas, a properly working plane was brought around especially for our gang and we all got back in our same seats. As the plane lifted off the ground, I squeezed James’s hand and gave the door a visual inspection. Have you got a story about a mishap while flying? I’d love to hear it.